A known Karachi-based philanthropist from Peshawar city, Dr Abdul Bari Khan, was given the first Chacha Younas Award in recognition of his services to the health sector. The award was handed at a special ceremony arranged by the Gandhara Hindko Board in the Gandhara Hindko Academy to honour the Chief Executive Officer of The Indus Hospital in Karachi. The tertiary care multidisciplinary hospital with 150-bed in-patient accommodation has a unique feature as it is run privately but has been offering services free of cost since July 2007 when the facility became functional. It is the first paperless hospital in the country and has an e-cardiology system. Khyber Medical University Vice-Chancellor Professor Dr Hafizullah, industrialist Khalid Sultan Khwaja, educationalists Zahoor Sethi, Khwaja Yawer Naseer, economist Shahid Yousaf, GHB Senior Vice-Chairman Associate Professor Dr Adnan Gul, Vice-Chairman Dr Salahuddin and General Secretary Muhammad Ziauddin, were also present along with several others. Hindko research scholar, Mohammad Ziauddin, said board members felt honoured by handing the first Chacha Younas Award to a great son of Peshawar, Dr Abdul Bari Khan, for his services in the health sector. Cultural activist, Dr Salahuddin, said Chacha Younas was thechacha (uncle) of the entire population of Peshawar. 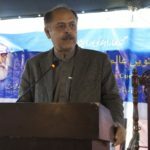 He recalled that Chacha Younas offered civic services for Peshawar as City Father and those services earned him a name which continues to live on. Shahid Yousaf, a Pakistani-Canadian economist and grandson of Chacha Younas, thanked the GHB for recommending Dr Abdul Bari Khan’s name for the award. 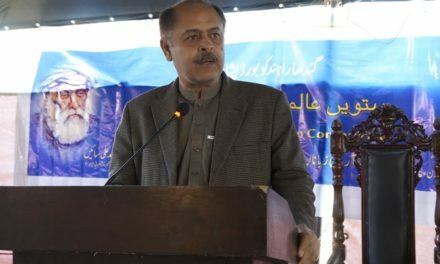 Shahid, who has generated huge donations for the poor communities of Pakistan from different parts of the world through his non-profit organization, Poverty Eradication Initiative (PEI), said such awards were needed to bring to the fore the excelling Peshawarites and highlight their services. Dr Adnan Gul greeted Dr Abdul Bari Khan on receiving the highest award of Peshawar. He said The Indus Hospital headed by Dr Abdul Bari Khan is among the few hospitals of the world where free heart bypass surgeries are performed. He said this hospital is a role model for those who believe in serving the humanity. Professor Dr Hafizullah said he wanted Indus Hospital-like facility in Peshawar for free treatment to the needy patients. He said he wished to set up the Peshawar Institute of Cardiology for the poor patients. We should join hands for this noble cause to turn this wish into a reality,” he suggested. Dr Abdul Bari Khan said that he was grateful to Allah for giving him the position he had. He said he would set up The Indus Hospital not only in Peshawar but also in other parts of the country.